He's a kid of few words. Show that you can buy more toys at yard sales than Target. Look up the retail value of his finds at home. Use a clear jar for home banking. Let him keep any loose $ he finds. Let me tell you, he keeps me on my toes with that last one! Yes! I'm teaching Dave Ramsey's Foundations In Personal Finance this semester to my daughter and another homeschooled student. We're sure learning alot and enjoying the creative ways he presents his ideas. Check it out! our 4 1/2 yo recently started getting a small allowance and it is heartening how quickly he has figured out how much more he can get for his $ at a thrift store vs. Target. and when they get older, use *white boards* like we do, to show the kids! they *get* the visuals! My dad took the boys out to breakfast one morning. They love to pay the bill with him because the hostess them a tiny piece of candy. My 6-year-old asked for the candy. My 3-year-old (M) asked for the change. My dad laughing said, M is going to be just fine not need to worry about him. We talk to Levi about money in terms of how long daddy had to work to earn it and how many jobs Levi will have to do to earn it. He doesn't get an allowence, but there are lots of jobs he can do around the house (besides chores) for money. 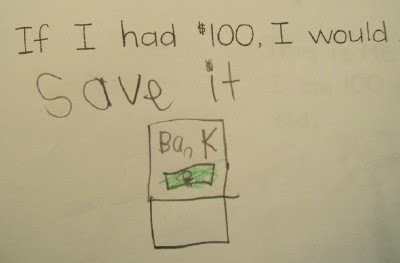 Wow, I'm so impressed by your teaching and your son's attitude towards money. I did not do this with my children at a young age and now I fear it may be too late...they are 14 and 12. Any suggestions? i know i'd love to hear the things you do to "teach" andrew....especially art...i loved those old posts..
My son has the bank and when he gets money he puts 10% in the Church, 40% in the Bank, and 50% in the Store. Kids learn what they live. I'm a huge believer in protecting the environment, using less, recycling, etc. Yesterday my 1st grade daughter brought home a paper she had to write in school: "Dear President Obama:... Here is what I hope you will do for our country: you shoud make shor nobody litters." (spelling her own). Aah, if only life were that simple. We teach our children thriftiness, too. I"m surprised she didn't suggest to him that he shop at yardsales! One time I took just my 4 year old to the grocery store with me. Everything I picked up she asked me if it was on sale or if I had a coupon. Next she asked me if it was on my list. She kept me in line that day! Wow..those are really great ideas!!! simple but wonderful!I love the Target one! I'm thinking of using a clean jar for my own banking...the bank is taking more and more of my money everyday!